Conor McGregor has announced about his plans to invade the alcohol industry with his new Whiskey,The Notorious Irish whiskey. He announced this during the post-fight conference after his over-hyped boxing match with Floyd Mayweather who has since gone back into retirement. In a well orchestrated move, Conor seems to have actually got the world`s attention as he took the opportunity to announce his partnership with David August, a fashion entrepreneur. 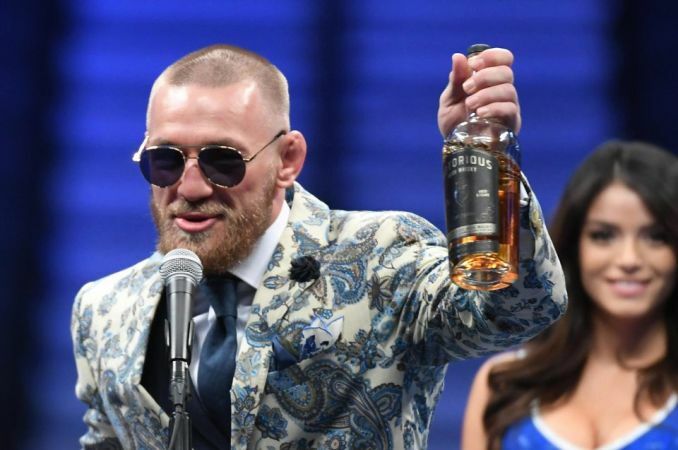 Although he lost the fight to Mayweather, he had a whisky glass in sight,maybe to celebrate the fight with the World`s greatest boxer,or maybe drown his sorrows.During the entire conference,he would occasionally take long gulps of the new whiskey,Notorious Irish whiskey which borrows his nickname, The Notorious Mac. Conor McGregor also has a sponsorship agreement with an energy drink that is fast-growing in popularity in Kenya,Monster Energy and Beats By Dre. From the look of things it seems he is diversifying his investment strategy to just outside the boxing ring which he just joined after a successful stint in mixed martial arts. Conor joins other celebrities in the alcohol industry where they act as brand ambassadors, advertisement models and even partners and owners.A good example is P.diddy who has made more than seventy seven million pounds from Ciroc!This was before he left the ambassadorship to DJ Khaled at the launch of the mango flavor of the popular vodka. Ciroc Vodka has continued to feature in most music videos and most of its success can be directly attributed to the P.diddy`s marketing era. Curtis Jackson,popularly known as 50 cents ,also owns a stake in Effen Vodka while Mila Kunis stars in the advertisement for an American Bourbon Whiskey,Jim Beam. Tatum owns a vodka named Born and Bred and for which he has even personally delivered to vodka enthusiasts through Saucey,an alcohol delivery service in the US. David Beckham is the ambassador for Haig Club,a grain whisky while Adam Levine,the lead singer of Maroon 5,a music band. Well,whether Conor McGregor`s Whisky will be a success as his fighting career remains uncertain as there is so much to do before a new whiskey brands starts moving off the shelf and into Irish whiskey enthusiasts` glasses.For instance,whiskey drinking Kenya are too conservative and settle for only the brands that have been around for decades. Whisky delivery in Nairobi is fast taking root as the population has embraced buying alcohol online by storm. Alcohol delivery in Kenya has become more popular according to data obtained from Dial A Drink Kenya,Nairobi`s favourite online liquor store.This can also be proved by the rise in number of customers that are requesting that drinks delivery Kenya be made a 24 hours alcohol delivery in Nairobi service. The most popular Irish whiskies that Nairobi drinks, Jameson, enjoys massive customer loyalty and is also one of the top selling whiskies in Kenya.Other Irish whiskies at Whisky delivery Nairobi include Bushmill`s,JnB Rare,Tullamore Dew etc. Irish whiskies are generally known not to use Peat during the malting process making them smoother than Scotch Whiskies.Learn more on what makes each whisky different from the other from our previous post. Subscribe to Dial A Drink Kenya to stay up to date with the latest happenings of the new whisky by Conor McGregor and any other drinks being unveiled in the alcohol industry.Meanwhile,don’t stay thirsty,enjoy alcohol delivery in Nairobi and its environs at no extra charges for drinks delivery and no minimum orders. Good news!Dial A Drink Kenya has increased its whisky delivery operational hours due to public demand.We are slowly moving towards a 24 hours alcohol delivery in Nairobi service.